DUMBARTON earned the victory which all but guarantees SPFL Championship football next season with a hard-fought win over play-off challengers Falkirk at the Dumbarton Football Stadium. 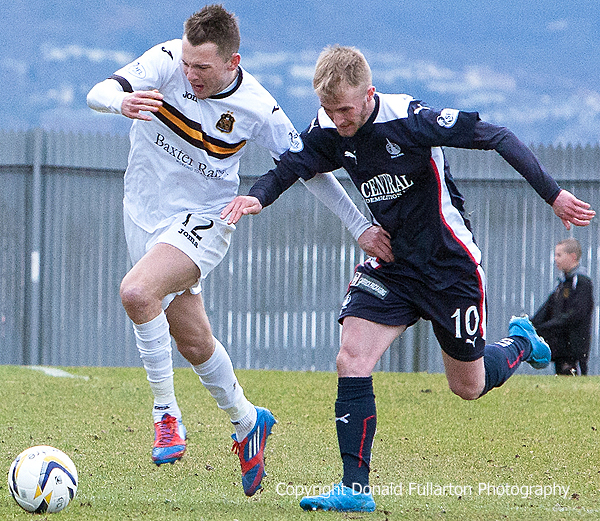 DUMBARTON earned the victory which all but guarantees SPFL Championship football next season with a hard-fought 1-0 win over play-off challengers Falkirk at the Dumbarton Football Stadium in front of a 1,016 crowd. It was a game spoiled by a very strong westerly wind down the ground, with the respective keepers struggling in each half to gain any distance with kick-outs. But it was exciting and competitive for 90 minutes. With the wind behind them the visitors had the better of the first half, but the home side mounted several attacks and came close through shots from Mark Gilhaney and Mitch Megginson. After the breaks Sons came more and more into the game, and at time there waves of attacks on Bairns keeper Jamie MacDonald. However the visitors also looked dangerous and forced some fine saves from man of the match Danny Rogers. Shortly before the end striker Archie Campbell won it for Sons, picking up the ball in midfield, driving forward and hitting an unstoppable shot into the top right hard corner of the net to spark delighted celebrations on the park and among the home support. The picture shows Scott Taggart holding off a challenge.